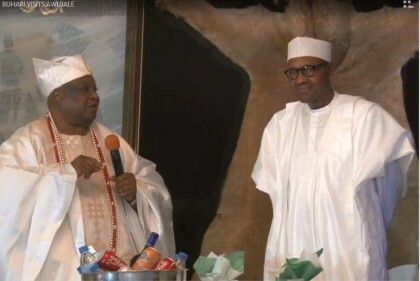 The Awujale of Ijebu land Oba Sikiru Kayode Adetona has expressed full support to the unwavering commitment of the Buhari Administration to rid the country of corruption describing it as critical to national survival and development. Oba Sikiru Adetona stated this while receiving President Muhammadu Buhari at his palace in Ijebu Ode as part of his two day official visit to Ogun State. The Awujale who is speaking on behalf of 51 other, traditional obas and 41 Otumbas present at the palace said he is convinced beyond reasonable doubt that Nigeria is now in safe and capable hands to realise her full potentials. He called on Nigerians to give maximum cooperation to the Anti corruption war and other promising socio economic development programmes of change. President Muhammadu Buhari accompanied to the palace by Governor Ibikunle Amosu of Ogun State and the ministers of information , Finance and solid minerals thanked the Awujale for the reception accorded him and his efforts at maintaining peace,law and order in his domain as well as improving the lot of his people. The president told the people to keep faith with his administration as it strives to implement the change Agenda. President Muhammadu Buhari was earlier received in Lagos on arrival at Murtala Muhammedu Internal Airport by the Governor of Ogun State and some APC leaders including former Lagos State Governor Bola Tinubu and and chief Bisi Akande.